welfare and comfort at the top of the list in everything we do. safe while living a high quality, fulfilling life as independently as possible. All of our staff are special and have all been chosen because they really do care. comfortable and homely care homes in Norfolk. But don’t just take our word for it, why not come and have a look for yourself. Please give me a call on 01603 432 050 to arrange a viewing. Broadland View Care Home is an elegant, privately run care home situated on the outskirts of Norwich, overlooking the picturesque Yare Valley. 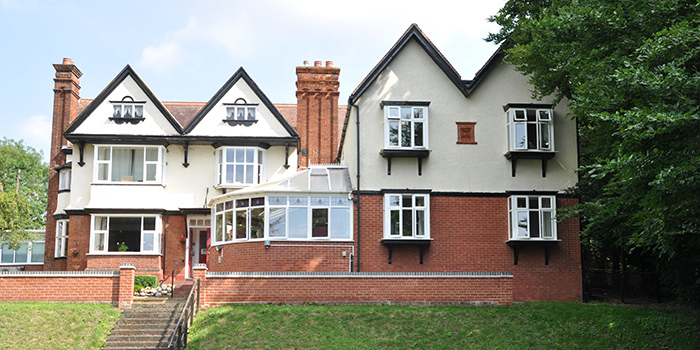 With 25 rooms, and just ten minutes drive from Norwich city centre, we offer high-quality specialist residential dementia care and day-care in a comfortable, friendly, warm and welcoming environment. One of the most homely care homes in Norwich, Broadland View caters for residents within an attractive period property bordered by two lovely gardens, featuring a fountain and mature trees. The home is set far back from the road yet remains close to local amenities. Room sizes are more in keeping with those that residents have been accustomed to in their own homes. We offer a high standard of healthy, home-cooked meals using fresh (often locally grown) vegetables and seasonal fruit. Personalised care plans focus on individual needs, interests and choices, and are developed by working closely with residents and their families. Visitors, including families and friends, are always welcome to visit the home. “The atmosphere is lovely. The care my mother receives from the care home staff is outstanding, the staff are very helpful and friendly. I couldn’t be more impressed, all round it is an excellent care home.